Large waves of love and romance are nice, but all waves of strong feeling, with their inherent illusion of certainty, must eventually crash into reality. The greatest strength is consuming fear as just an illusion and not a reality. The day that we would be together would be the best day of my existence. but I'm living each day as my worst, because I know, the day I've been dreaming is just an illusion I chose to believe in. Fear is a manifested lie, created by you influenced by others beliefs. Fear doesn't exist because it is an illusion. Fear is a lie which is created to make you think that you're not worth more than you actually are. Fear is a lie enforced to control and make you tremble. Fear was made for superiority gain. Love is an illusion, but I would willingly fall for it if I could believe in it. When you dream alone, with your eyes shut, asleep, that dream is an illusion. But when we dream together, sharing the same dream, awake and with our eyes wide open, then that dream becomes reality. We born alone, we live alone, we die alone. Only through our love and friendship can we create the illusion for the moment that were not alone. Illusion refers to distortion of one’s senses. Illusions are no way near reality; they distort reality, but are experienced and shared by several people. We can experience several kinds of illusions, but optical illusions are the extremely well understood and experienced. 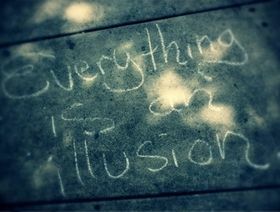 The term “illusion” refers to some type of sensory distortion and indicates the misinterpretation of a true sensation. On the other hand, “hallucination” refers to distortion in the absence of a stimulus. To quote Cyril Connolly, “in order to be happy we must select the illusion which appeals to our temperament and embrace it with passion” Mimes refer to a repertoire of illusions created by physical means. Mime artists create an illusion of acting or being acted upon by physical means.